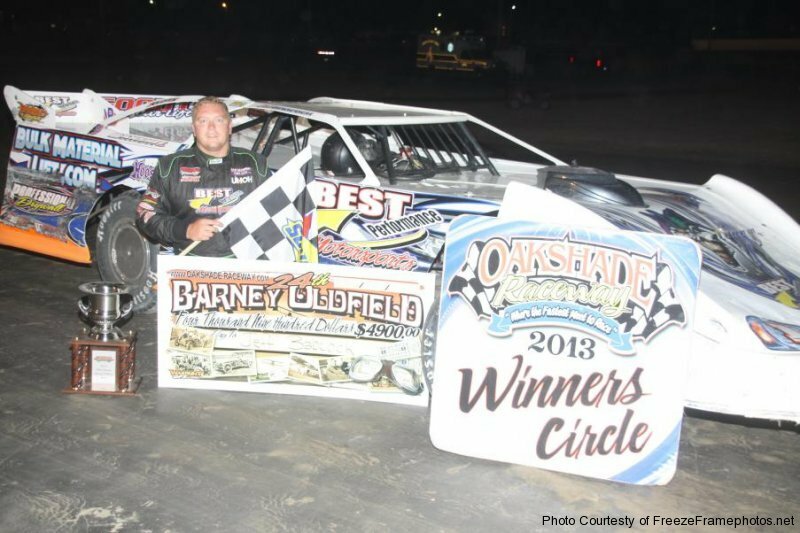 Jeff Babcock pocketed $4,900 after winning the 24th Annual Barney Oldfield Race/American Late Model Series (ALMS) feature event at Oakshade Raceway on Saturday night. Babcock started on the pole of the 40-lap ALMS feature and opened up a big lead early. Andrew Reaume, Brandon Thirlby and Dona Marcoullier battled hard for the second position the first part of the race. Marcoullier finally cleared Thirlby and Reaume and set his site on trying to reel in Babcock. 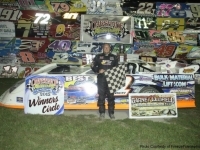 Without the help of any caution flags, Marcoullier was able to chip away at Babcock’s lead while working through slower traffic at the back of the field. Just as fast as Marcoullier would begin to close in, Babcock would again open up his advantage. 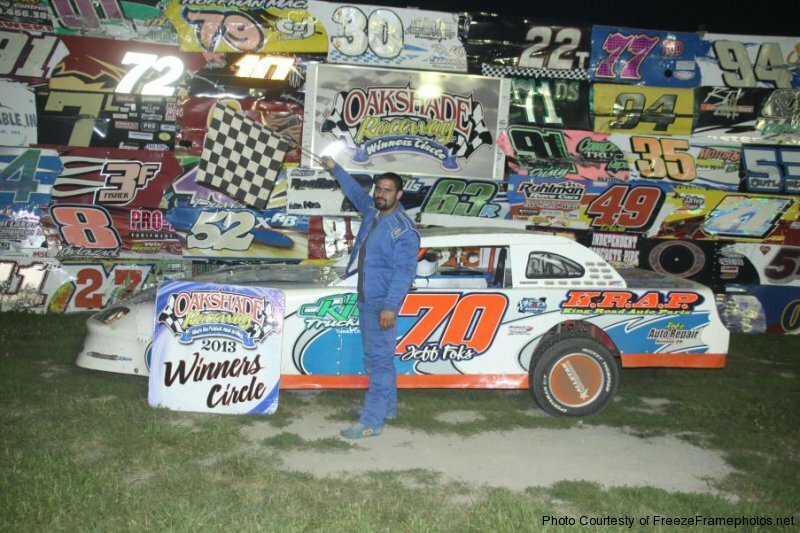 He went on to post his second UMP Late Model feature win at Oakshade this year. 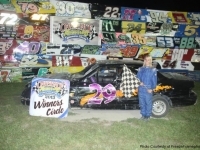 Marcoullier maintained his point lead with his second place finish. 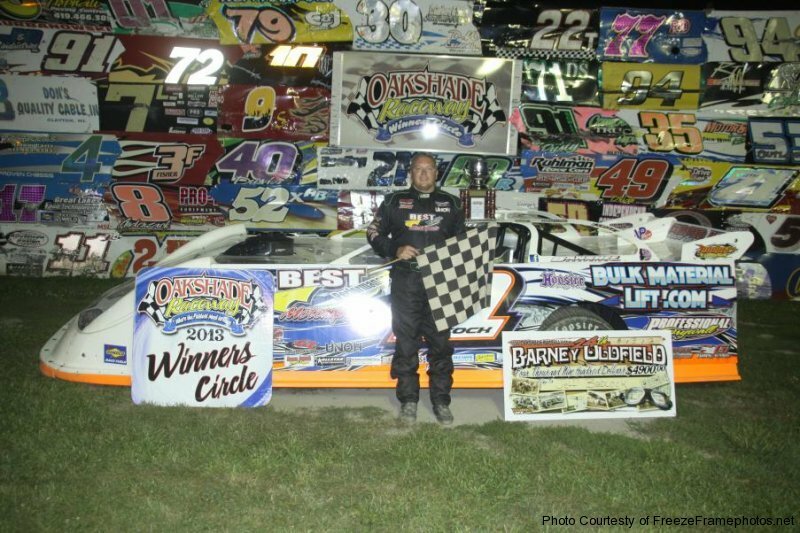 Reaume finished third followed by Steve Kester and Brian Ruhlman who started 14th. 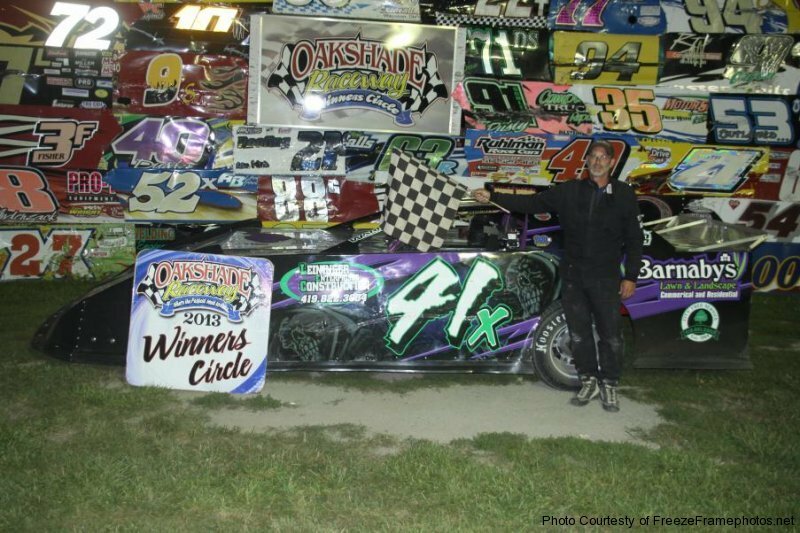 Mike Jessen and Tim Line put on a great show for the lead in the Sportsman feature as the two drivers raced side by side lap after lap and continually traded the lead. Line led the first lap, while Jessen took over on lap two. Line fought back and reclaimed the lead on lap nine shortly after a caution for Drew Smith’s spin. A big wreck on lap 11 that involved Ryan Kimball, Chane Stuckey, Kyle Turley and Bob Krumm slowed things down and gave Jessen one final shot at Line for the lead. 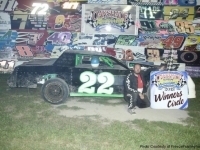 Line managed to pull away after the restart and raced his way to his third straight feature win after sweeping last week’s Sportsman Twin 25’s. 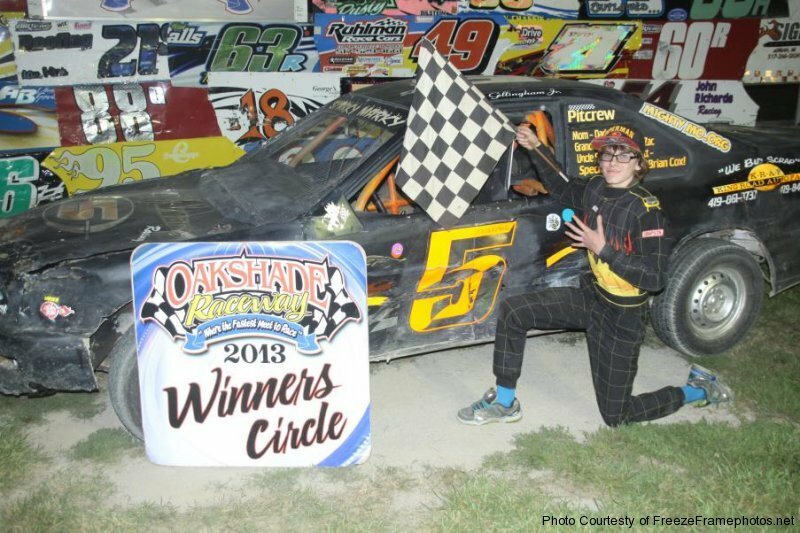 Jessen settled for second with Rich Ruff finishing third. Joe Derbeck was fourth followed by Jim Scout who earned another top five finish. 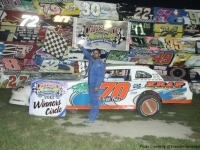 Jeff Foks continued his string of dominating runs in the Bomber A Mains with his sixth consecutive feature win. Foks took the lead from Adam Noonan on lap five and led the rest of the way to the finish. 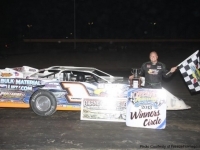 Noonan’s second place finish was enough to keep him on top of a tightening point battle over Terry Rushlow, who finished third, and Jeff Foks who is third in points despite his seven feature wins. 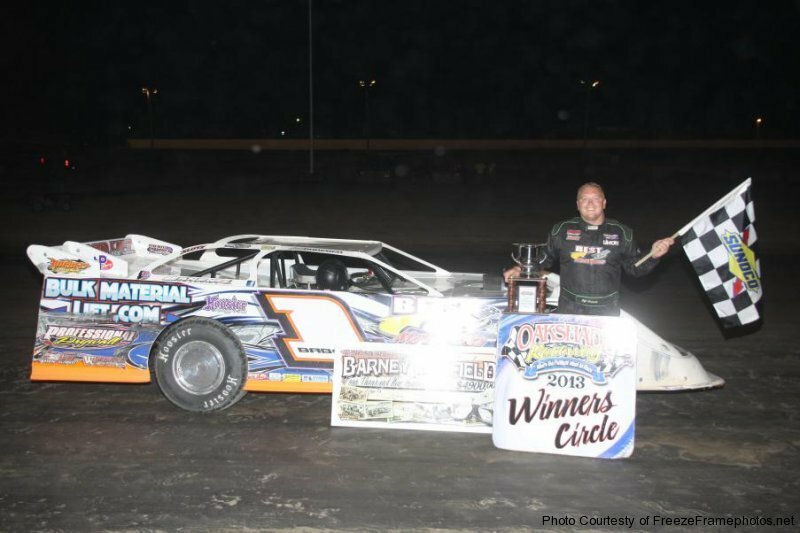 Gregg Detray and Chris Sands rounded out the rest of the top five finishers in Saturday night’s A Main. 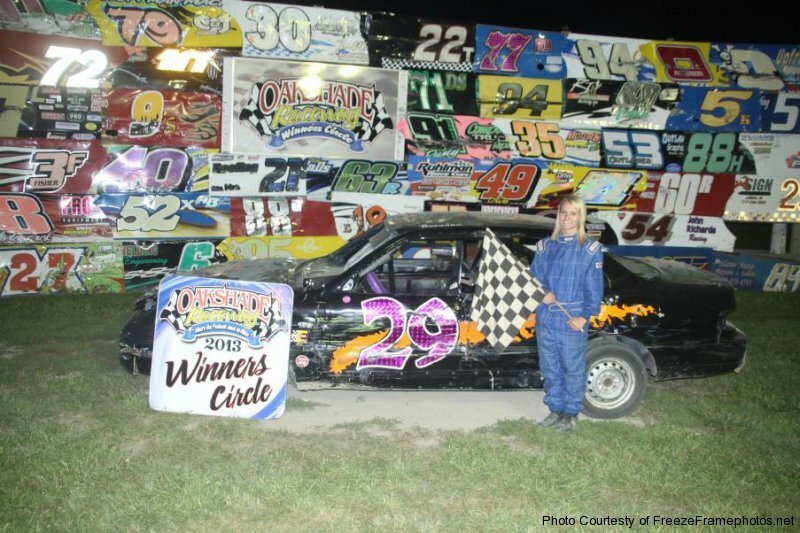 Breanna Franks earned her first Hornet feature win of the year with Cody Laney second. Laney remains atop the Hornet points with Franks trailing in second. 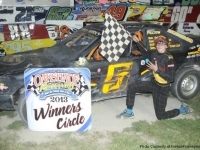 Despite “Sparky Marky” Gillingham Jr. picking up his fifth Sport Compact feature win of the year, Austin Casteneda remains the point leader in that class. 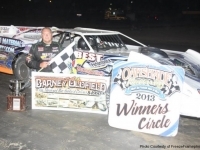 Gillingham won over Junior Jerry Hoot, Terry Rushlow Sr., Cory Gumm and Nathan Shaffer. After a couple of cautions at the start of the Bomber B Main, Perry Cox, Dave “Gumby” Golembieski Jr., Jim Remly and Curt Dickie battled for the lead early. 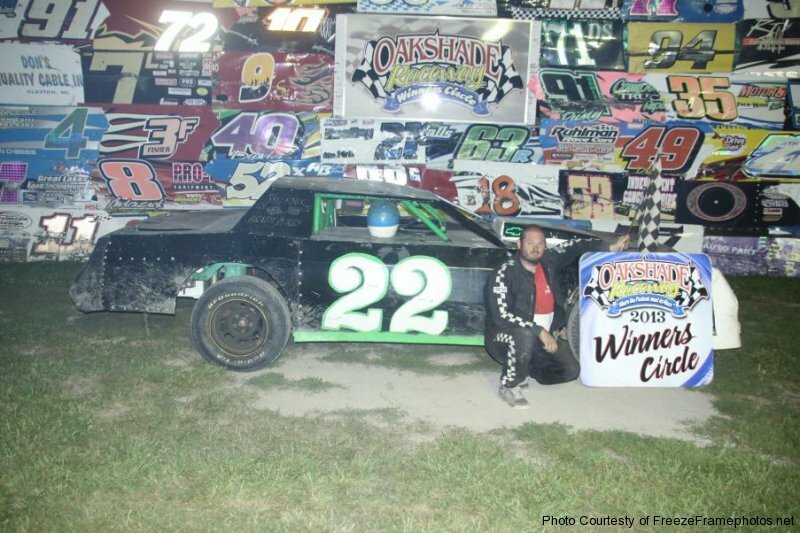 Curt Lancaster started last and worked his way up to fifth by lap five and then spun, costing him a top five finish. 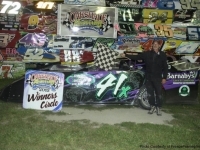 At the end, Dave “Gumby” Golembieski Jr. earned his second B Main feature win of the year with Cox finishing second. Remly and Dickie finished third and fourth respectively with Amy Clair finishing fifth after starting in the last row. Scott Hammer grabbed the early lead in the Bomber C Main before driving too hard into turn three and opening the door for the Mike Plotts, Bill Reeves Sr. and Nathan Goodman to get by. 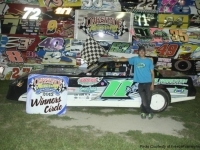 Reeves eventually took command and pulled away with the lead on his way to the feature win. Plotts finished second followed by Mike Poland, Goodman and Collin Walker. 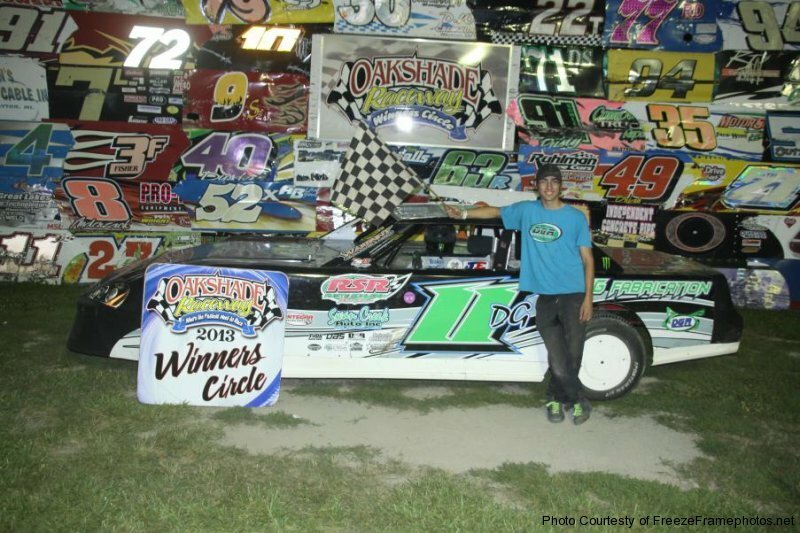 Oakshade Raceway will host a full racing program of UMP Late Models, Sportsmen, Bombers, Hornets and Sport Compacts on Saturday, August 10. Gates open at 4pm with racing at 7pm.